This lecture was given and recorded in Los Angeles sometime in the late 1960s or early 1970s, shortly before the Easter holiday. As with other Neville Goddard lectures I’ve transcribed, I couldn’t find a transcription of it online, so I decided to do it myself. I’ve uploaded the audio of this lecture to my Google Drive; if you want to listen to (or download) it, click here. Now, here we are, this crowded week of observing these different days. This is the season, and actually it’s the year. What did Paul give to the world? What he gave to the world is this: that the spirit of God and the human imagination are one. Here is the one that became the many, that the many may become the one. For one must be all, and comprehend within itself all things both small and great. Everything in the world, all that I behold, though it appears without, it is within, in my imagination, of which this world of mortality is but a shadow. So whether (?) we are told that I– if I be lifted up, I will lift all men, and draw all men unto me. Therefore all men are already redeemed. But they have to experience it within themselves. They are already redeemed. But in this world of mortality, this must be now… I would say, repeated within the individual. For he must contain and experience all within himself. There is only God in this world. God only acts and is in existing beings or men. Now let me share with you a story that was given to me last Friday night. This lady’s husband’s name is Ray. When I use the word “Ray,” I am speaking of her husband. Then she said, “I was working at my sewing machine. It’s an old one, but it was adequate. It did the job. But I would like a new one,” she said. “And so I imagined a new one. Here is the old one, but I imagined the new one. Then she said, “Ray said to me, ‘My new shoes hurt.’ He’d just bought them, and they were hurting. But I wanted him to have shoes that did not hurt… that in my imagination. All this was last year. “Then came the turn of the calendar year, and we had a robbery. Well, they didn’t steal the roof, but they took the other movable objects. And this past week I got a settlement from the insurance company for two-thousand-and-fifty-odd dollars. I now have my nice new sewing machine, I have my nice, lightweight tape recorder, Ray’s shoes do not hurt (audience laughter), and there is money for the roof, and much, much, much left over. Now… who instigated the robbery? Everything is moving under compulsion. No one sees the invisible causation. No one sees the invisible imaginal acts that is putting pressure upon everyone who is bent in a certain direction before the needed act to produce the imaginal act that is completely unseen by the world. Here, every natural act, natural effect, has a spiritual cause, and not a natural. A natural cause only seems. It is a delusion of the fading vegetable memory. So the first cry on the cross: Father, forgive them. They know not what they do. They’re all asleep, moving under compulsion. And men and women– unwittingly, most of them… some wittingly– are setting the whole thing in motion. And they simply move. So someone given to the feeling of getting something for nothing… so he takes the tape recorder… if he sells it for anything, that’s profit. It cost him nothing. No matter what it cost her, whatever he could get for it, that was sheer profit. If he goes out and finds something that he stole for [that is worth] a hundred, and he could move it quickly for fifteen dollars, and one gets a bargain, he made fifteen dollars. It cost him nothing. His investment was nothing. And there are those in the world who think that way. They’re all passing through the furnaces. So the first word on the cross… a word on the cross meaning not “a single word”… it’s a completed thought. So the shortest word [completed thought] is “I thirst.” But there are two words. Then the next one from John is “It is finished.” There are three words– all right… still, it is one word [completed thought] when you take the seven words. So the first word is from Luke: Father, forgive them, for they know not what they do. And then comes Luke’s second [I thirst], then comes John’s first [It is finished], then comes Matthew and Mark, and then comes two from John, and then Luke completes it: Father, into thy hands I commit my spirit. Now when he [Jesus] said– and this little punctuation mark has been pushed around, in the second word of the cross which is from Luke– and a thief turns to him and asks him to have mercy on him, and he said, “Behold, I say unto you. Today thou shalt be with me in paradise.” But you could alter the punctuation mark and put the comma after today, but… no. Leave it just as it is. “Behold, I say unto you: today thou shalt be with me in paradise.” This is now resurrection. And I— when I am lifted up, I will draw all men unto me. For all things are in my own wonderful human imagination. And I am all imagination, so when I am lifted up, I draw all at the very moment, I draw them all with me. But they individually must have the experience that I have had. But they are already redeemed, because I took them up with me. Because all things exist in the human imagination. And anyone who was resurrected… well, he can’t be resurrected and leave behind him any part of himself. So the whole vast world is raised up with him. I am telling from experience. The heavenly chorus sings when this thing took place. They sing the fall– actual fall– into division, and the resurrection into unity. They sing it out. And then the regeneration through resurrection from the dead. They actually sing it out! And the words It is finished– I heard it. But I didn’t sing it. The heavenly chorus sang it. When I walked by, everyone was made perfect, as I was perfect. And then, at the very end, the chorus sang out, It is finished. That was the sixth word on the cross. And the last one is, when this garment comes off, and that is the 31st Psalm, the fifth verse: Into thy hands I commit my spirit. Complete the verse: Thou hast redeemed me, O Lord, faithful God. That was the promise in the beginning: I would fall into division, and become fragmented. Dwelling in all, that not a thing in this world could be apart from me, because how could I be apart from something that I’m going to influence? Because all things by a law divine in one another’s being mingle. If I’m not penetrating you now, I couldn’t see you. You couldn’t hear me if I didn’t penetrate you and you penetrate me. So all things by a law divine in one another’s being mingle. So when I am lifted up, I take with me my entire universe… my whole vast world… knowing that every one that is now shattered in that world will have a repetition of the same experiences. For one fell into division and then resurrected into unity, bringing all back together into the one. So in her case… I can’t tell you how thankful I am that she shared it with me. That she could now actually feel that the robbery which seemed at the moment such a shock… she lost the tape recorder, she lost this, all the movable objects. And then came the settlement from the insurance company for two thousand and fifty-odd dollars… which replaced these with the new ones, or the like ones, and enough to put on the roof, and then still left over. So Father forgive them… yes, the thieves of thieves, it’s yourself pushed out anyway. Here tonight someone is accused for stealing maybe, what… have a little cup or a saucer, and yet the bank where I bank, the California bank, they’re looking for internal thief who stole fifty million dollars last year from their subsidiary in Basle in Switzerland. Fifty million dollars! And they know it all is on the inside– it could only be on the inside by trusted employees. They think they can bring it down to six– six trusted employees. They can’t quite put their fingers on it because in Switzerland, there are all these strange, hidden accounts. But they are missing fifty million dollars. So someone goes into a bank and holds it up… gets a thousand dollars, and they balloon the whole thing. The other thing is hush-hush. Here is a bank in Illinois, a few months ago, close to seven million dollars, and they still can’t quite put their finger on how it happened on the inside. No one came in and robbed them. And we speak of the little shoplifting on the outside. And the poor little girl goes off to jail, or the little boy goes off to jail… I’m not condoning it. If you could stop the embezzlement from the inside, your dividends would jump from a perhaps little three percent or four percent to twenty percent… if you could only stop it from the inside. All things happen, really, in the true sense of the word, from the inside. So that every so-called act in the outer world that seems so… well, a cause in itself. May I tell you every natural effect has a spiritual, imaginal cause and not a natural. A natural cause only seems. It’s an illusion. Of what? The fading memory. Man can’t quite remember. Luckily, she remembered when Ray said “We could use and need a new roof.” But it would cost a thousand dollars and so that’s put into the future. She remembered when he complained the new shoes were hurting. In her mind’s eye she revised it instantly, at that moment: the roof and the shoes. When she worked on her machine, she revised it… it was adequate, but she said, “I have a new machine.” Sewing machine. And putting the heavy tape recorder away, she wanted a new one that was light of weight, and she revised it, and she got, in her mind’s eye, a lightweight, new tape recorder. Then she goes home one day to find the house had been robbed. She had carried insurance, because he bought her the insurance, and here they paid her the two thousand dollars, which replaced all these things in a new way. So I tell you, this story is the greatest story ever told. There is no story like it. But Christianity needs, forever and forever, to be saved from secular history. It is not secular history. It’s the history of your own wonderful human imagination. God, and your own imagination, are one. They are one. You are an immortal being. You cannot die. Because you are all imagination. And when you actually know it from experience, then you can wipe your tears. Nothing can pass away. You may not see them with the mortal eye, touch them with the mortal hand, but they are in a world just as real as this. Just as real… continuing the journey until they reach that moment in time when they are resurrected, and then the scattered body begins to be collected, and they’re gathered together into one. So one must be all, and comprehend within himself all things both great and small. And you are that one that actually fell, and then, in falling, you became fragmented. You became divided, into the unnumbered parts, and each seems to be independent of you as you look out on it. You’re only looking on yourself pushed out. And your whole vast world must make real your unknowing imaginal acts, or your knowing imaginal acts. I ask you to trust this teaching. Believe in your imaginal acts. You may not see it tonight, or tomorrow, but believe in it. Actually assume the most glorious thing in the world for yourself or any aspect of yourself. Trust it. And that imaginal act, if it takes a thousand or ten thousand or a hundred thousand of your projected selves, will use them to make that thing become real in your world. As I’ve told you time and time again, imagining creates reality. That all the objective facts of the world are produced through imagination. There isn’t a thing you can name in this world that was not first imagined. But you can veto it the minute you imagine it. You can say, as she could have said, “We can’t afford it,” and stop it. She didn’t say “We can’t afford the thousand dollars for the roof.” She saw the roof, and it was new. But she didn’t see the robbery. That’s the means. Now, let me turn you now to the fifty-fifth chapter of Isaiah. My ways are higher than your ways, and my thoughts than yours. This is the chapter where you are told: My word shall not return unto me void. But it must accomplish that which I have purposed, and prosper in the thing for which I sent it. I, even I, am he. I kill; I make alive. I wound; I heal. I do all these things, and none can deliver out of my hands. He’s playing all the parts. And if one is physically inclined to steal, He will use it to produce the necessary means to get the money to put on the roof. So she comes home and there was a robbery. All the things have been replaced with new ones, and better ones, as she desired them. At the moment it seemed to be a shock. But she set the whole thing up in motion, for she’s the one who spoke those words: I kill and I make alive. I wound and I heal. And none can deliver out of my hands. For the spirit of God and the human imagination are one. And there is nothing but God. All things were made by Him, and without Him, was not anything made that was made. And so if all things are made by Him, is there a thief in the world? He’s playing that part. Is there a so-called hero in the world? He’s playing that part. A coward? He’s playing that part. He’s playing every part in the world, and it all adds up to produce the unseen imaginal acts of men. So you are alone, and you think, “No one sees me. And this means nothing. It’s only my imagination.” And you carry on your lovely imaginal act. And so that’s it. Not knowing that you are actually producing tomorrow’s effects in this world. And when it comes into the world, that natural effect has an unseen invisible imaginal act as cause, and not a natural cause. A natural cause only seems. It is a delusion. Delusion of what? Of your fading memory. You don’t remember when you did it. So when confronted with your own harvest, you can’t quite believe it. You can’t remember when you did anything that could actually be like this. “I didn’t rob myself. I never thought for one moment of robbery to get the money.” No… but I did see the whole thing done. But who is the being that is there? So the wearer of the mask called “Neville” is Father. That being in that mask, behind that mask, that no one sees, is God. And there’s a whole vast Christian… who celebrate this victory of God… that He actually died, literally died. But God’s first attribute is mercy. And God turned death into sleep. And then rose the sexes to work and to weep. And so all the sexes rose as masks… when God died, he buried himself in humanity and died. And then his first attribute– mercy– turned into sleep. That’s what (William) Blake meant when he said “Eternity exists, and all things in eternity independent of creation, which was an act of mercy.” That was the merciful act: to turn death into sleep, and God is dreaming this dream. One day He will awake. Now when He awakes, He resurrects. And then He gathers into His own being all His scattered beings. So all are gathered together. When I depart this time, may I tell you I am taking everything in the universe with me. And I, when I am lifted up, I will raise all unto me. Read it in the twelfth chapter of John. Not one can be left, because all things exist in the human imagination. But it’s not raised up until He who is scattered is awakened to unity. And then He draws into His one being all that was scattered. So they sing His fall into division. And His resurrection to unity. His fall into the generation of decay and death. And His regeneration into the generation or the resurrection from the dead. So when He actually is raised from the dead, He gathers all into His own being. And they’re all with Him, no matter where He goes… He has this whole vast world raised up– hasn’t left one behind Him. For everyone shattered in the world will have a reproduction of that drama within himself. So what is now being dramatized as a memorial this week– for this is really a memorial… this is simply a great memory, a remembrance of what God has already accomplished. And so they’re perpetuating it through Good Friday, then comes the burial on Saturday, then comes the resurrection on Sunday. But the whole thing is done. It’s all done… only to be repeated in the individual, and then the individual, who is seeming scattered, becomes the unit, and He draws in the vast world unto Himself and He is resurrected. So the one becomes the many. And then the many become the one. So whenever one is raised, He takes this whole vast world with Him. Even that seems to be left behind. And every aspect that it seems is behind becomes the unit, and then it raises up. So one must be all. That is the story of the Christian mystery: one must be all. So the first cry on the cross: Father forgive them. They know not what they do. And they do not know what they do. They go blindly on under compulsion, executing the unseen imaginal acts of humanity. And they move under compulsion. To pick this up… I told the story, I was severely criticized for it by a lady at a dinner party one night, when Fred Vale (???) who is now gone from this world, and he gave a party at the Ambassador Hotel. And I had told this story about two weeks before, and one of his great, I would say, contributors, who would come, and always write…give a big check at the end of the year or the end of a month to keep that going. And she was most critical that night as I said, I didn’t feel well that night at all. And she said, “You know, I can’t quite understand how you could take the platform, an audience of twenty-six-hundred, a thousand who could not get in– they’re all overflowing, at the Fox Wilshire– and tell what you told concerning your wife.” That was my first wife. I told a simple story to explain that everything in this world must be forgiven– I don’t care what it is. We sailed for Barbados six months later and she met my mother, met my family, met them all, they all loved her. That was back in 1936. In New York City, because of some archaic law, that’s now past, you couldn’t get a divorce unless she was insane for seven years, or adultery. And that’s all. The Orthodox Christian churches had sewn the whole thing up so it made life miserable, and made everything simply, well, a burden to all. Well, when I met her, I had just such an entangled background. And here is New York City, the most archaic city in the world concerning such laws. I went to bed and slept as though I were happily married to the girl who now bears my name. I did not have any physical emotion with her. Just she was sleeping there, and I am here, and it’s blissful. I did that for one solid week. Then comes a telephone call from the court one morning… telling me that I must come down to this Federal Court on Tuesday morning. Well, I was groggy, it was early in the morning, and in those days I didn’t rise as early as I do now. And so I said, “All right” and I hung up. Well, I wasn’t shaved, I simply threw myself into some clothes, and off I went to a taxi down to the court. And I got there just as they were bringing her in. He sentenced her to six months, and then on my plea, he suspended it. She knew I was looking for her. And my dancing partner told her I was looking for her to serve the papers and therefore to be scarce and move out of New York City. So she did. But she had to commit the act. And they had to call me and ask me to throw light upon that. How could I condemn her? Who was the actual cause of her shoplifting? I slept as though I were blissfully married to the girl who now bears my name. And I had to get the evidence– I had to get some reason to bring the action– and here my wife actually gave me the papers. That’s illegal. To serve your own papers. But she drove up to my hotel where I lived, I went up to my room, came down to the lobby, gave her the papers. I did my own service. Now that is an illegal thing in this world. But… then I got my divorce, in the city of New York, that I could marry the girl who now bears my name. They’re all moving under compulsion. And the unseen causation is hidden from the world. They do not know who is treading in the winepress. And I was treading in the winepress to be happily married to a girl who was not then engaged to me. Because I couldn’t get engaged to her, under the circumstances. And then my wife behaved in such a manner that it made it real and natural for me to do what I did. How could I blame her? They had to do what they do. I had to fall into division, and fragment my being into the unnumbered parts called “humanity.” And then rise into unity, and gather all my scattered members together, and rise as God himself… that’s the story. It is God who fell, and God rises. So I know from my own experience: nothing dies. Those who have not had the experience here… all right. They’re restored in a world that is terrestrial just like this. And they continue their journey until that moment in time when they’re resurrected. And resurrection is resurrection into unity. And their outpictured world–the whole vast universe– is themselves pushed out. It’s gathered together then, and they move up, and I, when I am lifted up from the earth, I will draw all men unto me. See it? This is the mystery of which we speak here night after night. You’re not some tiny little thing just pushed out. You are the whole. And the day will come when you will find that you really are the all. So not one person in the universe could be outside of you when you are resurrected. Because as you are raised up, you raise all with you. And each will have the experience of being raised up. And all eventually will be the one. And in that day, there shall be one. His name one, as we are told in Zachariah. But Blake tells it so beautifully, in his “Dream of Nine Nights” called “Vala” or “The Four Zoas.” And then he tells the story of the falling into division. And when they’re all gathered together, this one man they call Jesus. And they in Him, and He in them, live in perfect harmony in Eden, the land of life. For you are the Lord Jesus Christ, whose resurrection they’re going to celebrate this coming Sunday. You tell that to the priests, they’ll slap you. Tell that to any minister. Because they are sound asleep. They do not know who the Lord Jesus Christ is. 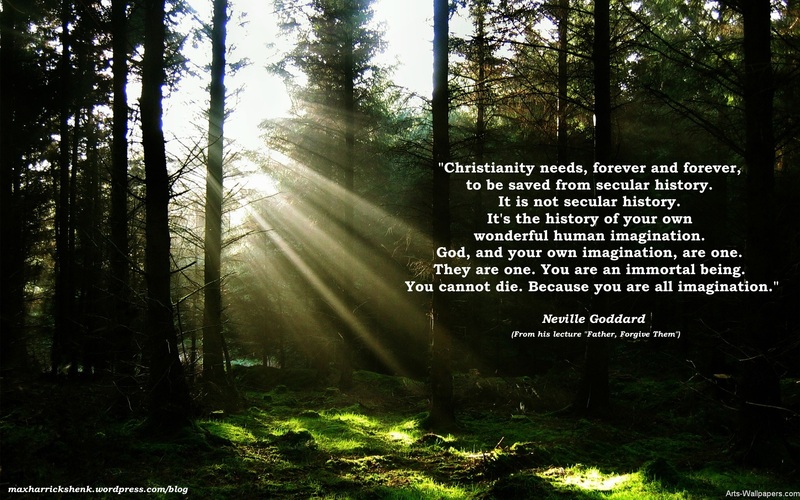 I tell you the Lord Jesus Christ is buried in you, and is your own wonderful human imagination. That’s the Lord Jesus Christ. And when he is raised in you, you will raise all in this universe with you. I want to thank my friend for sharing with me her experience, and being big enough to remember. If man could only remember the imaginal acts. She remembered when the roof needed repairs, or a new one, and the cost was excessively high for them at the moment. She remembered her husband complaining about the pain the new shoes caused… the weight of the tape recorder, and then working on the machine, the sewing machine, and it was adequate, it was good, but she would like a new one. And then came out of the nowhere a robbery, and took all these movable objects. And then came the insurance, that sent the check for two-thousand-odd, that replaced all the movable objects and enough for the roof, and much much over. So she can actually say, “Forgive them, Father,” those who took it. Did they not do her a favor? And yet they are thieves in their own eyes, and thieves in the eyes of society, and they are. You know who played the part? God. And you know who actually made them do what they did? The lady who wrote me the letter. Now she knows the words in that thirty-second chapter of Deuteronomy. I, even I, am He. And there is no God beside me. I kill, and I make alive. I wound, and I heal. And there is none that can deliver out of my hand. So no matter what happens, if we only had the memory, we could trace it to a forgotten imaginal act on our part.